I really find it hard to believe there's a need for such a topic, but apparently it exists. Regular readers / members look away now. Recently I've been running some analyses on incoming google searches that have brought visitors to the forum. Over the last 28 days, 5 different visitors have arrived at various topics, trying to date their Seiko 7Axx's ! what is the age of my seiko 7a38-7070 ao chronograph watches? - now re-hosted by SCWF: http://timeuniverse.com/photodatabase/seiko.html but unfortunately neither appears to work any more. Others have come up with alternative Excel-based solutions. See: http://www.thewatchforum.co.uk/index.php?showtopic=33736&view=findpost&p=703869 (clicking on embedded link downloads). But to work out the date of manufacture of a Seiko 7Axx (from the case-back 6-digit serial number), you don't need a calculator. In fact it couldn't be easier. The last 4 digits are the production unit number for that caliber operation, within that month and year (up to a maximum of 9999). 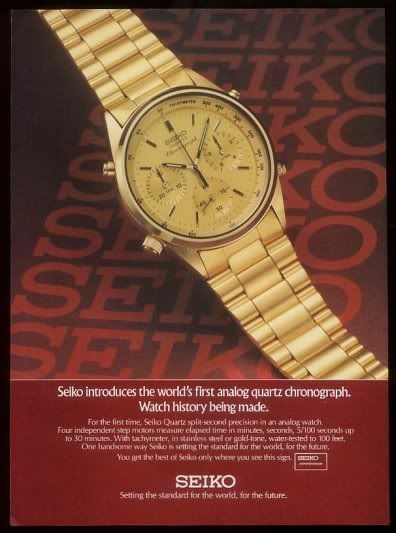 Seiko 7Axx's were officially produced (by Seiko*) from 1983 to 1989, although a number of 7A28's were manufactured in late 1982.
through to 99xxxx = September 1989 - for ZFM models 7A38-7085 and 7A38-7295 produced by Seiko's Brazilian offshore operation. *The French Seiko subsidiary C.G.H. were still producing Yema N8's using re-branded (Shimauchi V906) movements up to 1994. This is great! Very useful! The serial number 383261 dates it to August 1983, but it certainly wasn't the 3261st 7A38-701B Vulcan produced !! It's likely that the 0001-9999 serial number range for August 1983 was shared with then concurrent 7A28 production. 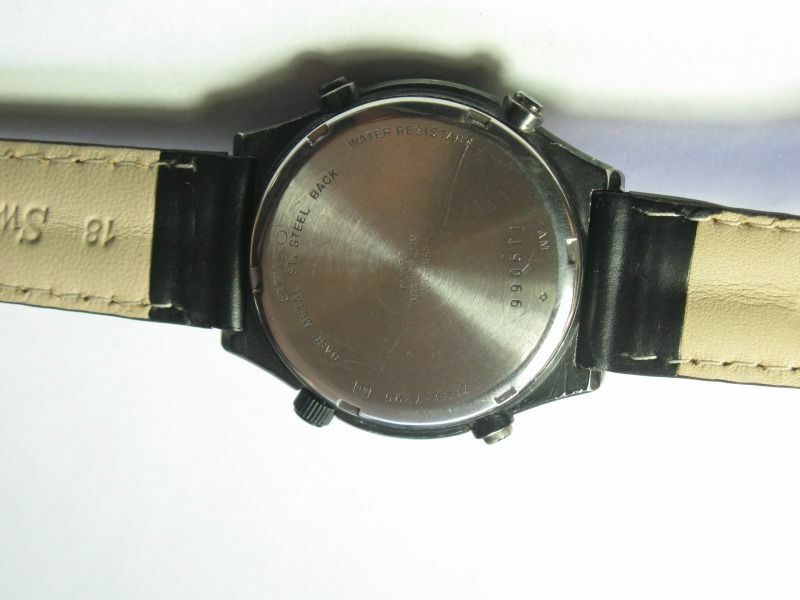 It was on a well-worn black chrome coated 7A38-7295, fitted with a leather strap in place of the original bracelet. The -7295 was the Brazilian offshore produced version of the 7A38-7290. You can just make out the ZFM stampings in the middle of the case-back. The serial number 990511 dates it to September 1989. Has anyone seen any older or newer Seiko 7A38's than these two ? The newest 'Made in Japan' 7A38 I own is a gold-tone 7A38-7289, with a serial number 965611 - meaning manufactured in June 1989. Hello, Brian, and welcome to the forum. 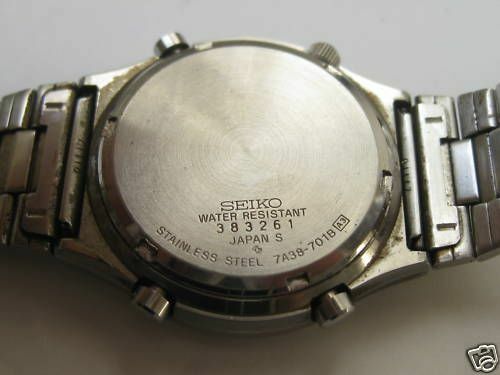 You're correct in that there doesn't (yet) appear be a single topic on the forum dedicated to the Seiko 7A34. However, they are mentioned, on numerous occasions in various threads in different sections of the forum. Their generally dressy styling and the positioning of the date window at 12 o'clock, which is obscured by the sweep second hand. The 7A34(A) movement is in effect, a cut-down version of the far more popular 7A38(A) without the latter's day wheel complication. 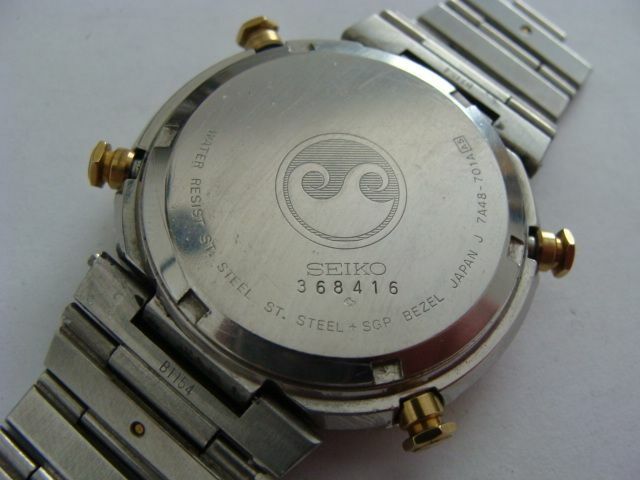 Seiko re-worked the 7A34(A) movement, by re-locating the date window to 4:30 for use in the Jean Lassale Thalassa 7A74 chrono. A few forum members, including Andre ('nova'), Simon ('Sir Alan') and myself have customised our 7A34's using 7A38 movements. As far as the subject matter of this topic is concerned, the D-I-Y date calculator works just as well for a 7A34-7010 as any other 7Axx. 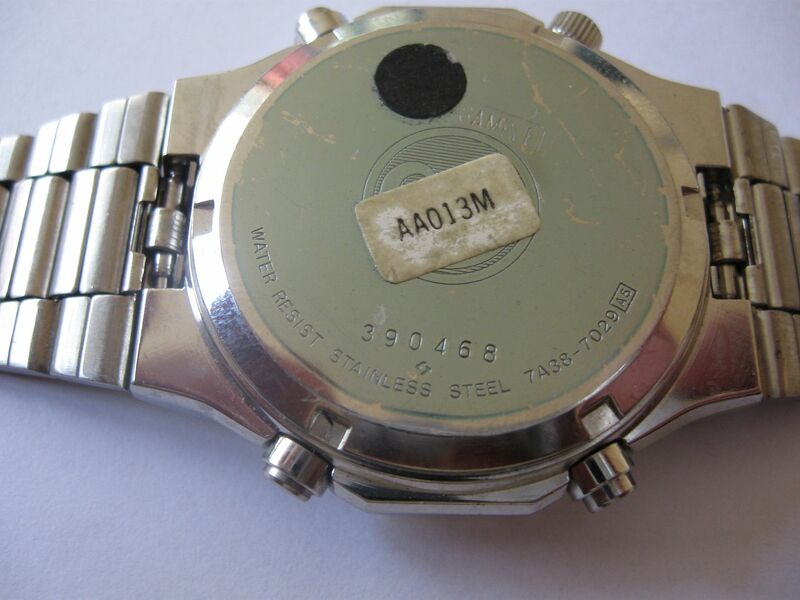 has recently (finally) been repaired: http://www.csce.uark.edu/~jgauch/photos/seiko/ Not that us Seiko 7Axx owners actually need it. Interestingly, I was trading PM's with a chap named Chris from WatchUseek earlier today, talking about his 7A48-7000. In his reply he wrote: Serial no 383474 - do you know how old that would be? Presuming Chris has read it correctly, his 7A48 was also manufactured in August 1983. So a very early production example. Seems you learn something every day ! my 7A48-701A AKA SPV002 is even older, being a June 1983 (368904). Thanks for that input Fabio. Can't say I'd previously taken a lot of notice of 7A48 caseback serial numbers before, but now I've looked at the few photos I'd kept on file, I've found more 36xxxx's: 7A48-7010's and -701A's manufactured in June 1983. This one was listed on eBay in November 2012. Seems that 7A48 production pre-dates 7A38 production by a couple of months. Something that would never have occurred to me. Guys, I have some interesting news for you. I recently bought a 7A28-7029. Since it had a few minor scratches on the glass, I wanted to have it replaced by the local Seiko representation. They came back and offered me to replace the complete case, since they had a NOS left. I agreed, and now it is really NOS, no scratches at all on the case and on the strap too, like new. This would mean now, that it was either produced in 1981 (May) or in 1991. You decide, which year makes more sense. Welcome aboard - and thanks for your input. It certainly is an interesting first post ! 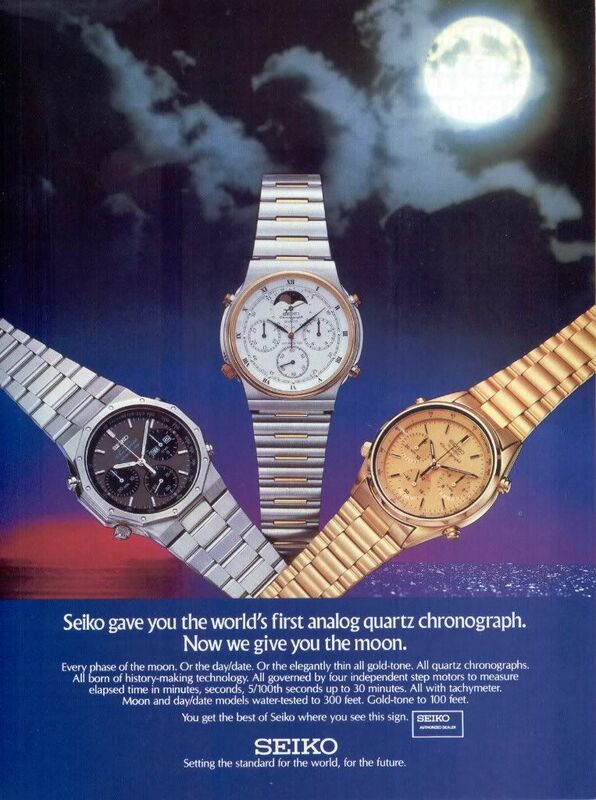 I'd tend to go with 1991, because Seiko didn't start manufacturing 7Axx's until late 1982 and the first 7A38's in August 1983. But as you'll have read, May 1991 is a long time after (offshore) 7A38 production appears to have ceased (September 1989). Not that I doubt your word, but would it be possible for you to post photo(s) of the watch - particularly the case back ? By the way, you say 'NOS', but did your replacement case (and bracelet) come from a complete new watch or a sample case ? Incidentally, that photo (and 7A38-7029 sample case) belong to a forum member Harry (a.k.a. 'whitemonster'). I've checked my photo folder and all such 7A38-7029 sample cases appear to have 39xxxx serial numbers, so were manufactured in September 1983. It was ordered from Seiko internally, so it is a new case, no sample. The strap was already without scratches, when I bought it. Here is the photo of the case back. My bad - and my apologies. I mis-read your post as 7A38-7029, when you actually wrote 7A28-7029. Bit of a difference there. Your photo link didn't work properly, so I've edited your post and re-hosted your photo in my PhotoBucket - it was quicker and easier (for me) than trying to figure out how to link from postimage.org. Being a 7A28-7029, that sheds a different light on it. Athough that model was also an extemely popular seller, particularly in the States, I'd be more inclined to go with May 1981, which makes that watch VERY early production indeed - if not a pre-production example ! It may not quite be the world's first analogue quartz chronograph - but it's quite possibly the 7th ever produced !! Thanks for helping out with the image. I also think that it fits more to 1981 than to 1991. And since it is a very low number (0007), it could be exactly as you stated. I am really happy with it, since it is now 'NOS'. Do you probably know, what the difference is between a 7A28-7020 and a 7A28-7029, both are goldish. A 7A28-7020 can be all stainless with a white dial (SPR007) or two-tone with a dark metallic black-ish coloured dial (SPR010). The 7A28-7029 is always gold-plated all over with a gold dial (SPR014). The 9 on the end of the case number designates a US market model. Thanks. Was there also a 7A28-7020 in all gold (case and strap)? Not that I've ever seen, No. 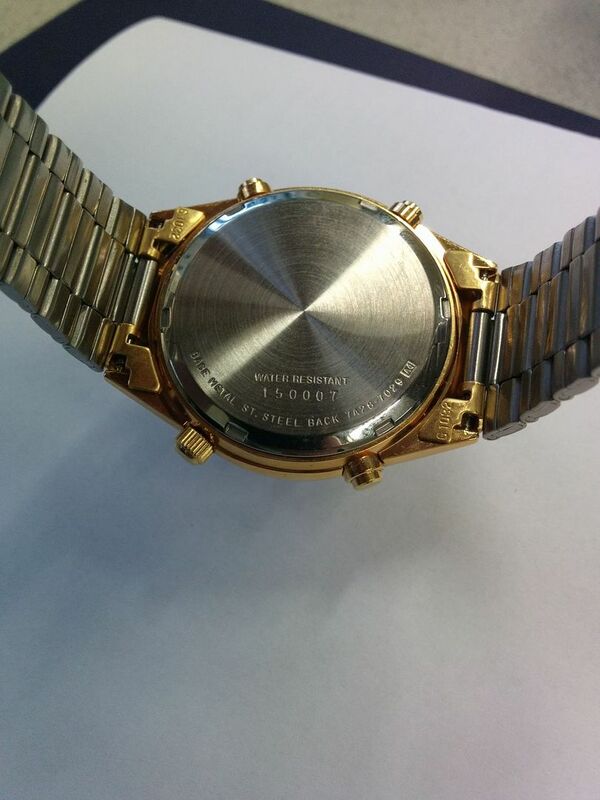 There was an all-gold plated gold dialed 7A38-7060 which looks similar though (but with day / date).